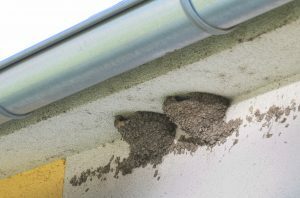 I’ve had an ongoing issue with barn swallows making nests on the side of my house (see picture I sent). They only seem to like one side but no matter what I do, they come back every spring and summer. I have been using my garden hose to wash away their nests but they build them right back like in a day or two. I don’t want to hurt them but they make such a mess on my home and their droppings too. 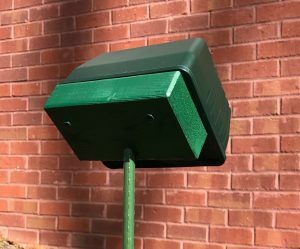 Will your bird repeller keep them away and how can I angle it up? My house is 30 feet tall. Our SOUND REPELLER is well suited for this job. And we have a simple MOUNTING BLOCK that angles the unit up. All you need to get is a 1/2″ stake like rebar, wood or heavy plastic and then drive it into the ground under the area where the birds are nesting. The mounting block will direct sound up at a 45 degree angle so if you place the unit 8-15 feet out from the side of the house, it should be able to direct the sound up to the roof no problem. As for which setting to use; this will depend on whether you power it by batteries or use the included AC Power supply. If you have access to a AC power, use the power supply. We have optional EXTENSION CORDS so you can create a length however long you need. So if you can power it with the AC power supply, set it to be on “Day”, the Ultrasonic setting should be set to “Constant” and the Motion Sensor Sensitivity is not important since it will be always on. The Sonic Volume should be on zero so you can’t hear it and the yellow frequency dial set mostly to the left for “Birds”. Using a mounting block, you’ll be able to set the unit off the ground and direct the sound where needed. The height off the ground is not important but in general, 1-2 feet high is fine. If you need to rely on batteries to keep it powered, set it to be on during the “Day”, the Ultrasonic setting should then be set to “Motion” and the Motion Sensor Sensitivity set to “30” so it will detect motion up to 40-50 feet away. The Sonic Volume should be on “40-60” if possible to give the birds an extra “scare” and the yellow frequency dial set mostly to the left for “Birds”. Using it this way means it will only trigger one when motion is detected. Batteries should last 3-6 months if not longer (it takes 4 “C” cells). Either setting will get you immediate results and you should not have swallows return to the protected area. Remember, these units are very much “directional” so for most homes, at least one unit per side of the home is needed for complete coverage. We also have a large MOVING SPIDER which would do a fine job too. We sell these mostly for woodpeckers but they work on all birds. The spiders are about the size of a paper plate and run on two AA batteries. Basically all you need to do is hang them on the side of the home where the nests have been forming. When birds land in the area, the spider will “turn on” and drop down a short 2-3 foot long piece of string. It then rewinds itself back up the string while moving its legs. 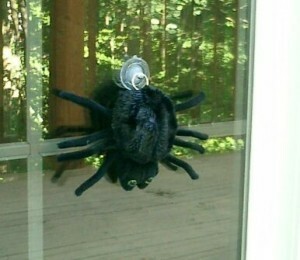 In most cases, once the birds see the spiders, they stay away. But having to leave the spider there all year long is a bit much for cosmetic reasons unless its on a side of the home where it won’t matter.